How does an egg become an adult? 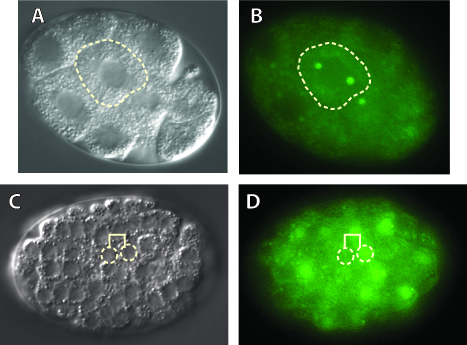 The means by which a single undifferentiated oocyte develops into a multicellular organism with numerous, intricately connected cell types is a major focus in developmental biology. Defects in the process of cell fate determination can lead to disease or death. Cell-to-cell communication is a common way that a cell (or a group of cells) is instructed to proceed down one particular developmental path versus another. 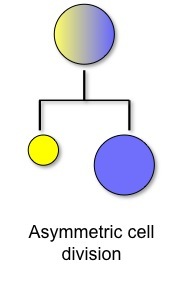 One way that cells execute these instructions is through asymmetric division of a polarized mother cell, generating two daughter cells that contain different fate determinants and thus proceed down different developmental paths (Figure 1). Since all multicellular animals progress through development by overcoming similar developmental obstacles, the molecular mechanisms that overcome these obstacles have often been conserved during evolution. We use the nematode, Caenorhabditis elegans (Figure 2) to address the problem of how cell differentiation works in multicellular animals. C. elegans has many attributes that make it well-suited to study developmental biology, including excellent genetics, transgenics, and a sequenced genome. Importantly for our research, C. elegans also uses conserved cell signaling pathways to polarize mother cells and induce asymmetric divisions throughout its development. The Wnt signaling pathway regulates cell fate in many animals, including nematodes and mammals. Wnt signaling stabilizes a transcriptional coactivator called β-catenin, which then binds to TCF/LEF DNA-binding proteins and converts them into activators of Wnt target gene expression. β-catenin regulation is therefore a crucial step in the Wnt signaling pathway. β-catenin mis-regulation is associated with developmental defects and human diseases such as cancer. Wnt signaling also regulates many asymmetric divisions in C. elegans. An essential component of this pathway in C. elegans is SYS-1, which binds TCF transcription factors and upregulates transcription of Wnt target genes much as β-catenin does in other organisms. 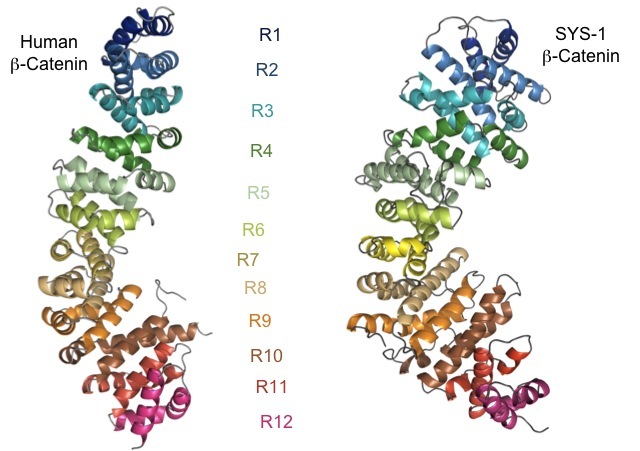 The crystal structure of SYS-1 shows that SYS-1 bears the structural hallmarks of the β-catenin family of transcriptional coactivators (Figure 3). Therefore, SYS-1 shows a remarkable conservation of both structure and function when compared to vertebrate β-catenin. We use these similarities (and the differences between the β-catenins) to dissect how β-catenins work. Other areas of interest in the Phillips lab are determining how the Wnt pathway functions in C. elegans, SYS-1/β-catenin regulation (see Figure 4), and β-catenin evolution. These studies will help us understand the larger question of why animal cells differentiate the way they do. A position for a graduate student is available. Admission routes include the UI Biology Department, the UI Genetics Program, the UI Molecular and Cellular Biology Program and the UI Biosciences Program. This page was last updated on Friday, June 30, 2017 - 2:43pm. 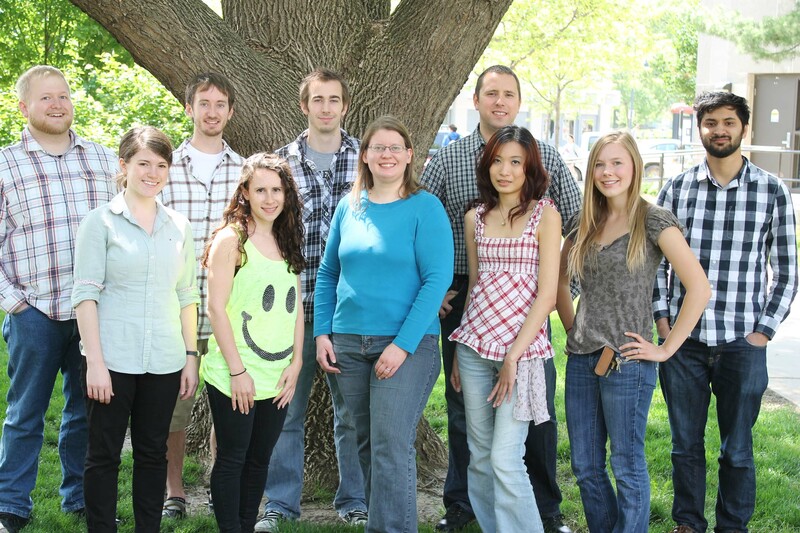 Please contact us at biology@uiowa.edu or 319-335-1050 if you need further information.